Day 7 of IJA 12 Days of Christmas brings us A Christmas Story. For many of you the first exposure to this movie was from the 24 hour marathon on TBS every Christmas (do they still do that?). Growing up this movie was synonymous with Christmas although I don’t think I saw the full film until I was older. The list of quotes and memorable moments though are ingrained in our pop culture. You’ll shoot your eye out! The interesting thing about each of the moments though are that taken out of the Christmas context could be funny any time of the year. So just as Kelley begged the question with It’s a Wonderful Life and Christopher with White Christmas, is it a Christmas movie? As far as the story is concerned I would equate it to something like The Sand Lot. A collection of memories from boyhood…that just so happen to be at Christmas. 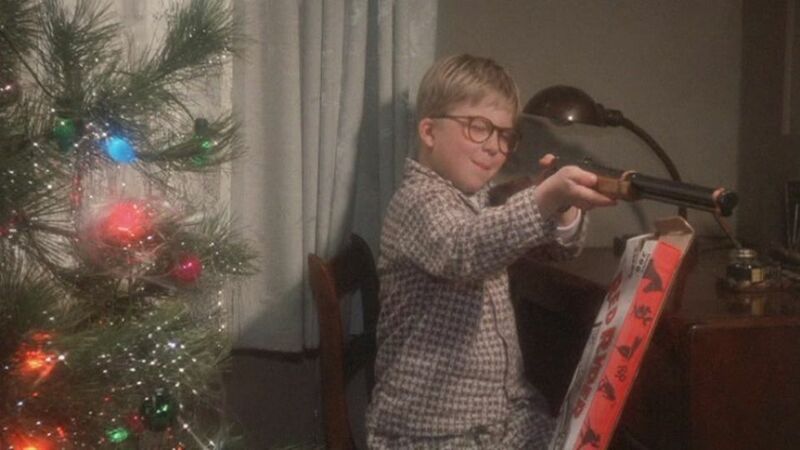 There’s not really much to say about A Christmas Story. There is no brilliant storytelling, directing or acting to stop and discuss. That critique aside, it is a fun movie with great one liners and memorable moments. It’s no wonder TBS airs it for a full day (are they still doing that? seriously somebody look that up). You can jump in at anytime and laugh at the kid who gets his tongue stuck to the flag pole, or giggle at Ralphie in his bunny costume. Then you can just as easily turn it off when it’s time to go to grandma’s house or when Christmas dinner is ready. I honestly enjoy this movie and will sit and watch it anytime it’s on but I can understand why some people say they don’t care for it (which is a surprising amount). A few years ago I was able to see A Christmas Story in a stage play – narration, kid actors and all. I have to say I appreciated the story more in that version. Then again if you have watched this thing a hundred times, you could probably act it out in your living room all the same. Tomorrow Charles will be reviewing Gremlins from 1984. Oh Gremlins…I look forward to leaving my comments… Thanks everyone!